Sign Our Petition & Join Us! Why the Campaign to Save the Rentals of Santa Barbara? Effective January 1, 2017, all Short Term Rentals (STRs) within the Santa Barbara City limits are subject to enforcement of a STR Prohibition approved by the City Council. Currently, the County of Santa Barbara is considering whether to prohibit, or allow (and regulate) Short Term Rentals. It is a crucial time for all community members who feel that well-managed (and regulated) Short Term Rentals provide great benefits to our community. Although there are examples of both of these issues occurring, we are certain that STRs are not a leading cause of our shortage of affordable housing, and we are also certain that the majority of STRs are well-managed, and that they are actually enhancing the residential neighborhoods in which they operate. The City’s decision to prohibit ALL short term rentals is not the correct solution managing this modern issue. It is an overreaching solution which has city-wide negative effects. There are much better solutions which can address the concerns of housing and neighborhood quality, while preserving the economic and social benefits provided by short term rentals. Please click below to see a detailed plan for the fair regulation of Short Term Rentals in the city and county. Our mission is to share the facts regarding short-term rentals and their impacts on our community. This is a complex issue where emotions, opinions, and solid facts must be evaluated before the best solution can be implemented. The citizens of our community are likely concerned about the growth of the vacation rental market. There is a feeling that the vacation rental market is contributing to the low vacancy rate of rental homes. This is a valid concern, however there are many more important reasons for the housing shortage. There are also valid feelings about negative impacts on the character of neighborhoods with regards to noise, parking, and other nuisances. These issues are usually caused by neglectful management of those rentals, and can be prevented with Fair Regulation (and enforcement of professional management standards). There are proven solutions from cities that have already addressed this issue. These locations now have fair and enforceable ordinances that maintain the integrity of neighborhoods, increase tax revenues, and result in a thriving modernized tourism industry. When properly set up and administered, Short Term Rentals bring visitors, family, former residents, temporary workers, medical personnel and professors to our area, while providing additional year-round business to local merchants, stores and service providers. Last year, the City and County collected a combined approx. $2.6 million in Transient Occupancy Taxes (TOT) with only a fraction of STRs paying TOT. With fair regulations that ensured full enrollment by all STRs, the TOT revenues would triple to approx. $3.6 million per year to the City of Santa Barbara, and quadruple to approx. $5.6 million per year to the County of Santa Barbara. That is a total of $9.2 million per year in potential TOT revenue that is lost by the prohibition of STRs. STRs are a major source of revenue for the City and County of Santa Barbara, generating about $470 million in overall economic activity, and creating approximately 5,000 jobs. There are other important uses of short-term rentals. Who are the people who stay in short-term rentals? Family members who come to town for medical surgery procedures. Former residents and students who know the town well. The friends and families of local residents who come to visit, when there is not enough space in their homes (and hotels are either unavailable or too expensive). Families on vacation looking for a more affordable “home-like” experience. Temporary workers, professors, medical personnel & families relocating for employment. Executive housing, insurance claim temporary housing, housing needed during remodels, people looking to move to our area. Who rents their houses out as short-term rentals? Primary residents of houses, retired people, and owners with flexible schedules. Second-home owners who live elsewhere part of the year, and owners who bought houses specifically to be used as part-time residency (with ownership costs offset by short-term rentals). Short-term rental visitors will choose to vacation in other cities that offer vacation rental accommodations. These travelers and their families generally will not choose hotels if no short-term rentals are available. Tourism is an amazing source of economic activity in that the dollars come to our region, and then the people leave and live full-time somewhere else. In other words, tourism is generating economic activity without taking up new housing units. If instead that same level of economic activity was replaced by a new office building and its employees, then those people will be needing local housing units and soaking up the supply. If you think it through, curtailing short-term rentals and thereby dialing back the economic benefits of the tourism industry, could very well result ina legitimate taking of housing supply from a more housing impactful economic source that becomes the alternative to the tourism dollar. It has been proven in Kauai, HI & Palm Desert, CA that prohibition of short-term rentals does not work. Those areas have reversed their prohibitions, implemented fair and simple short-term rental regulations, and are now considered successes. We have created an outline that presents the over-riding principles that will allow STRs to co-exist within current bylaws and zoning. These principles can be used to craft a simple and effective Short-Term Rental Ordinance that ensures the benefits of STRs are realized, and negative effects are minimized (or eliminated). Theo Kracke won a battle in his ongoing lawsuit against the City of Santa Barbara over its decision to ban short-term vacation rentals (STVRs). Earlier this year, the City filed its second demurrer (this is the third time that the City has attempted to get this lawsuit dismissed). However, on June 26, 2017, the court overruled the demurrer and made certain findings that validate the core arguments of the lawsuit. Now that this major obstacle to the lawsuit has been removed, it will proceed in court. The battle over short-term rentals is far from over in Santa Barbara. Most rentals were banned by the city council, but residents living in an areas where it is permitted are running into difficulty when trying to get city permits. A lawsuit against Santa Barbara’s ban on short-term rentals can proceed, according to a ruling in Ventura County Superior Court. At the same time, a motion by the city to strike the challenge by vacation-rental business owner Theo Kracke under a statute aimed at quashing malicious lawsuits was denied. Join these organizations and individuals in supporting our mission! We have several expensive projects underway which need funding. 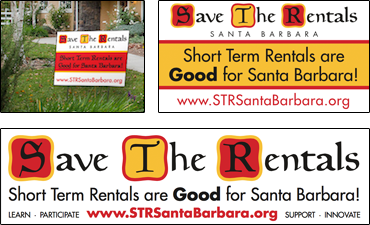 Let the Santa Barbara City Council and Santa Barbara County Board of Supervisors know that you are in favor of well-regulated short term rentals! Promote our cause and show your support for short term rentals with an 18" x 24" Yard Sign, 5.5" x 3" window sticker or 11" x 3" bumper sticker! Copyright © 2018, Save the Rentals Santa Barbara. Photographs are courtesy and copyright Scott Gibson Photography and may not be copied, reproduced or redistributed without permission.